Lucky Stripe - Do You Speak Gossip?Do You Speak Gossip? Alternative title: Gone with the wind! Seriously, this was one of the most windy days, hence the crazy-all-over-my-face hair. I couldn’t keep them down for long. Apart from that it was a really sunny and beautiful day, if you were standing under the sun. Otherwise, in the shade, it was really cold. Luckily I was under the sun most of the time, so I didn’t get too cold. Anyway, my bf finished his basic military training after a few weeks in the army, and they took their vows (I really don’t know what is called in English, so excuse me for that) and this is where I was, when I was wearing this outfit. I wore something really simple and casual, as I wanted to be comfortable, because I knew I was going to be out of the house the whole day. I also want to add that these photos were taken with my small camera because I didn’t want to carry so much weight around all day. Sometimes the little one is much easier. So please excuse the lower than usual quality. As you can see I slightly curled my hair for that day, but you can’t tell much of a difference with the wind blowing them in most of the photos. 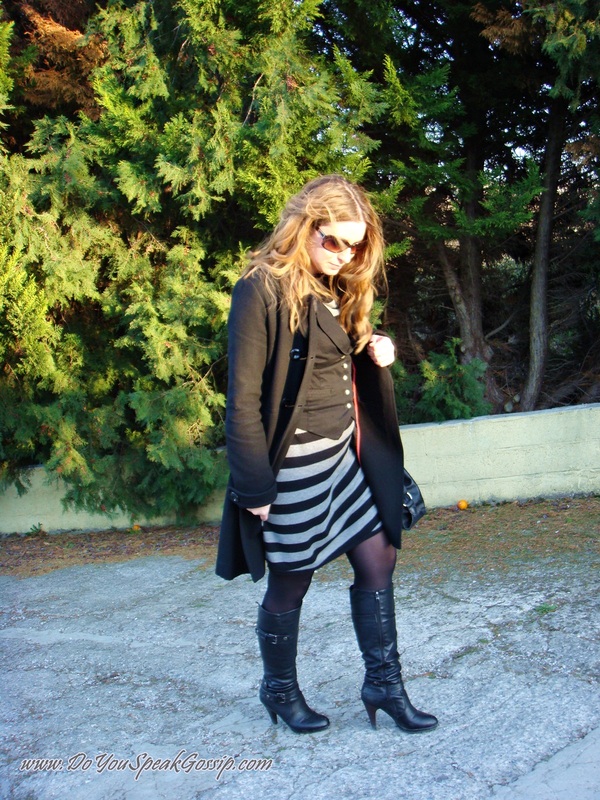 Coat: Pepe Jeans, Striped dress: Mexx, body (underneath): Venus Victoria, local store vest, local store boots, Donna Karan sunglasses, Penny Black bag. Oh and look who’s on the back of my vest! Did you see? Ok a closer look, then! 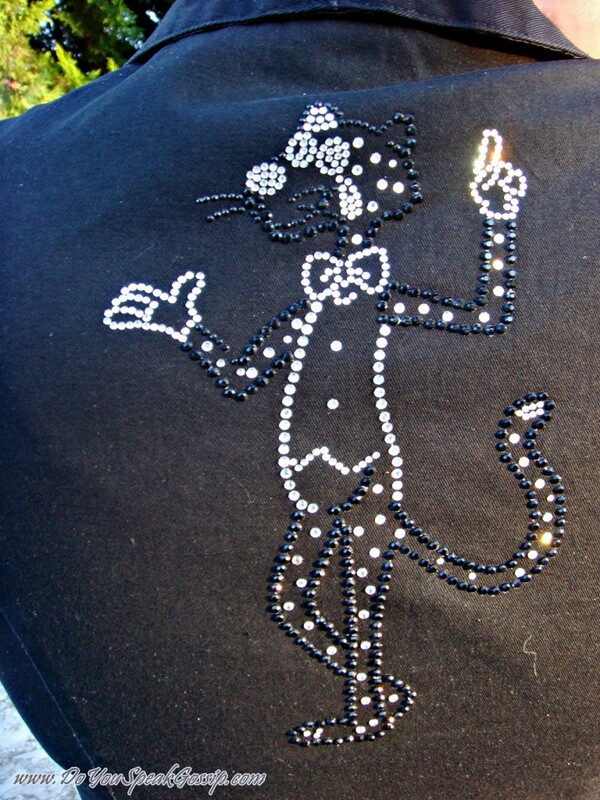 It’s “Pink Panther”, or a black and white one made with crystals. 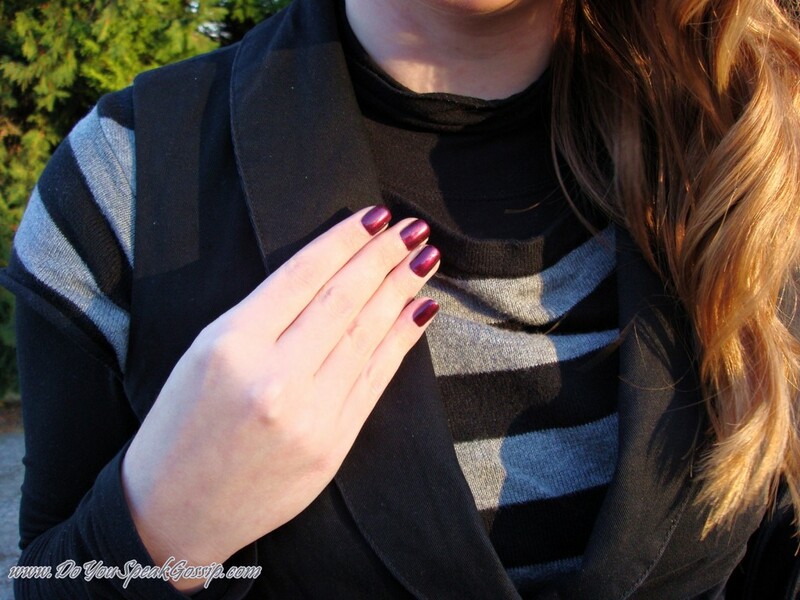 I have this vest for years, and I love this cute little detail. Oh and I wanna show you my nail color again. I seriously loved it! The pics were taken over a week ago, but it lasted me once again, more than 1 week, and it stayed perfect the whole time. In case you’re interested it’s GT Cosmetics (no. 346) by Tommy G.
See you next time! Have a fantastic weekend! And don’t forget to follow my blog! Πολύ ωραίο το φόρεμα! Σου πάει πάρα πολύ! Πόσο όμορφο και παιχνιδιάρικο αυτό το γιλέκο! Elsa recently posted..Jean Paul likes it light! Can I say that I love the jacket? No adore it! I like the black/gray look. Very chic and right up my alley. Cute style! Casual kai omorfo outfit! Kompsotato xoris na einai ipervoliko!!!! Oraia i leptomereia sto gileko! Filakia! Μ αρεσει πολυ το παλτο! great coat! i like your layering here….and the pink panther, too! hooray to the first online purchase…look forward to seeing them in posts! love the jacket and stripes! Very nice!Such a great coat! Πολύ όμορφα τα μαλλιά σου!!! Ο πάνθηρας στην πλάτη φοβερή λεπτομέρεια!! Μοντέρνα Σταχτοπούτα recently posted..Παπούτσια MIGATO Άνοιξη Καλοκαίρι 2012. Οι πρώτες αφίξεις! παρα παρα πολυ ωραιο! !εχω μια ιδιαιτερη αγαπη στις ριγες κ το παλτο ειναι τοσο κομψο! caramellitsa recently posted..600 Followers Giveaway :κερδίστε ένα πλεκτό κολιέ απο το Penelopeart.gr !! Aaax, einai strato o kaimenos?! Me pianei mia sigkinisi me tous stratiwtes! Hsouna mia kouklitsa pantws, eimai sigouri oti itan poli xaroumenos pou se eide k perifanos pou isoun dipla tou! You look great as usual, love the curled hair, I think it looks really great on you! The weather does look really nice too, hope you have a nice week! You look great even though it was windy. I really like that trench! Thank you all so much for your amazing comments! You make me feel so good! I just love your vest honey. And this dress looks amazing on you. Your blog is seriously fantastic!! I’ve probably read all the post there are!! I LOVE your nail polish! Its the perfect pop of color with this chic outfit! love the simplicity of the outfit! The stripes is really preetty! LOVE the coat & your entire look! The small camera took some great photos. I know what you mean about traveling light sometimes. Oh yea, your pink panther vest is the BOMB.COM!! great vest! i like how you paired it with the dress.